Earlier this year I got Lauryn Chun’s “The Kimchi Cookbook: 60 Traditional and Modern Ways to Make and Eat Kimchi” from the library. 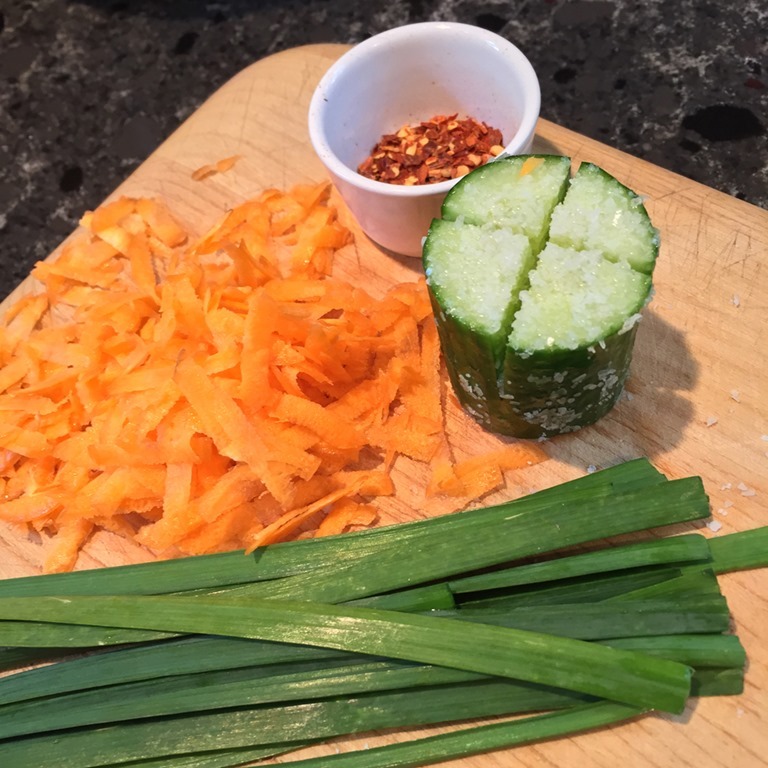 I have made simple kimchi in the past with Chinese cabbage and bok choi from our garden and I was interested in expanding my repertoire focusing on the things I grow. One of the ingredients the recipe called for and that was mentioned in several other recipes in the book is Korean chives or or buchu. When I was reading the description I started to wonder if that was one of the plants I was growing, having scavenged it from the weed pile. There are advantages to being in a community garden with a large international population! 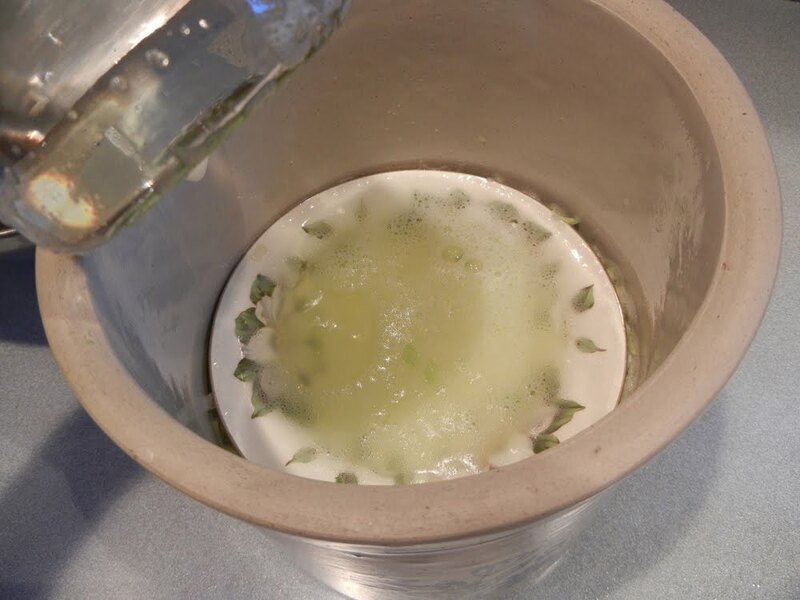 The description of my odd little clump of chives matched—flat leaves and with a slightly garlicky flavor. I would also add that there is a definite grassiness but I don’t know if that’s normal or because it is in the process of flowering. In any case, I used it. 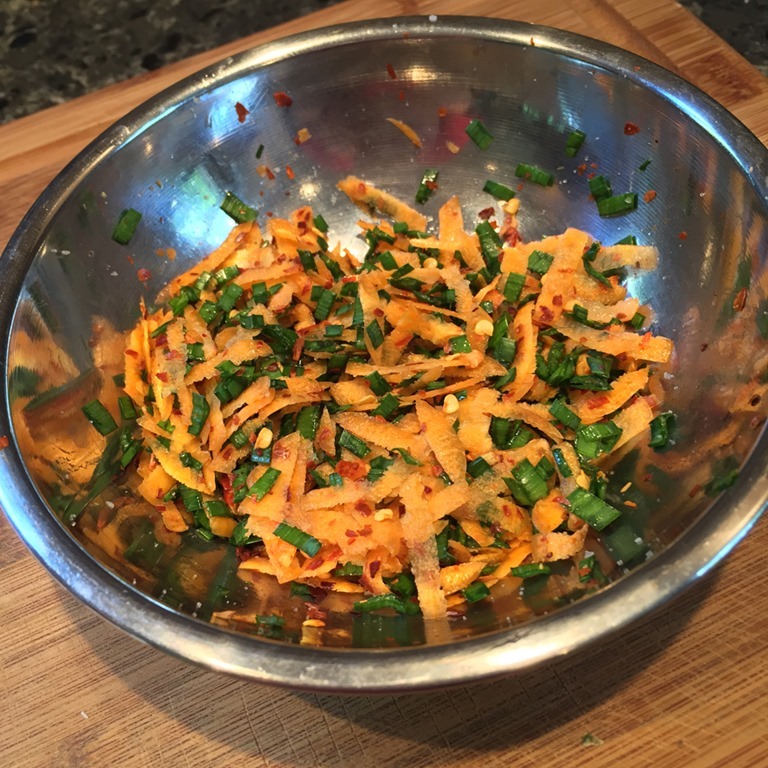 The stuffing consists of the chives, grated carrot, sugar and Korean hot pepper flakes. I didn’t have any of the pepper flakes so I substituted Penzey’s Medium Hot California style. The proportions I used for everything were a little off from the original recipe because I made a reduced size batch. Next time I will grate the carrot finer and use more of it. 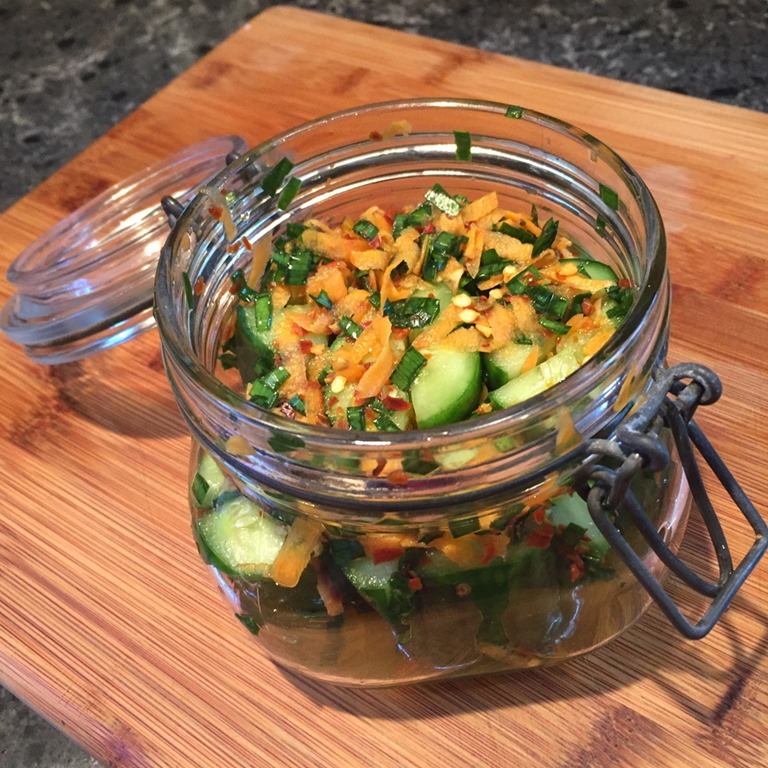 After they are salted, drained and stuffed, the cucumbers get packed in a jar and sit at room temperature to ferment for a couple of days. Since it was so warm here I stuck them in the fridge after just a little less than a day to chill them and slow the fermentation. The verdict is in and this recipe is a keeper! 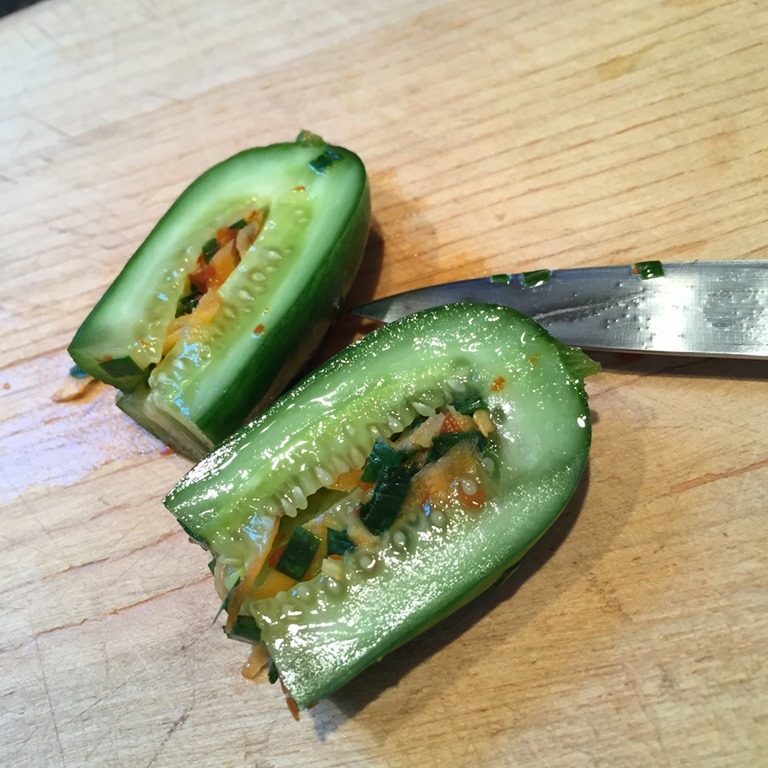 I’ve saved a few more from the book to try including another cucumber kimchi and a contemporary stuffed tomato kimchi. I’m looking forward to trying them out. 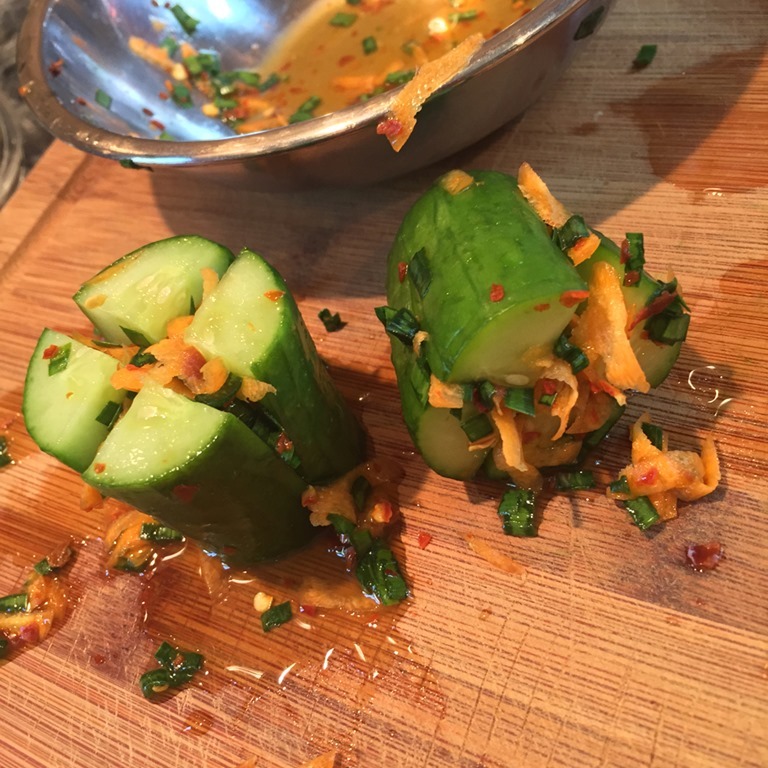 Have you wandered from the mainstream kimchi path? Where did it take you? Apparently my first attempt at making sauerkraut was successful. Along the way there were a couple of surprises. The first was that it didn’t stink. What a relief. I think the method of covering it with plastic wrap had something to do with that. When I’d check on its progress I always did a sniff test and while it developed a “vegetably” fragrance it wasn’t offensive. You could only smell it if you stuck your nose right in the crock. The second surprise was that it was done fermenting long before I expected it to be. I was figuring on a four week process. Somewhere in week three I read something to the effect of “it’s done when it stops bubbling.” I hadn’t noticed mine bubbling for several days at least so I decided to go ahead and put it away. Freezing didn’t seem like a good idea and the refrigerator was way too full at the time so I opted for canning it using the boiling water bath method. The entire batch fit nicely in four pint jars. During the canning I could definitely smell it but didn’t think much of it. Soon after I was done the Co-conspirator came home and announced that the kitchen smelled like an outhouse. Earlier this year I did a fun little “dream home” exercise where I listed on paper all the things I’d like to have as part of my ideal home. One feature is a summer kitchen–an outdoor, covered but unenclosed cooking area. There we could can away to our hearts’ content without steaming up the house in the heat of July, fry fish and can sauerkraut without stinking up the place, and share the “external benefits” of our cooking adventures more with our neighbors. For nearly a year I’ve had a little voice in the back of my head urging me to try making my own sauerkraut. It started whispering about the time I attended the first Fermentation Fest last fall in Reedsburg. I didn’t attend a sauerkraut workshop, but in an exhibit I saw there and the reading I’ve done since I’ve discovered that making sauerkraut at home is a pretty simple and straightforward process. What may have been holding me back was the memory of a crock of cabbage fermenting in my grandmother’s kitchen. First, it was huge. At least it seemed huge to me and I’ve seen some big ol’ crocks at the Fest and elsewhere. Also, the recipes at the National Center for Home Food Preservation and in my USDA book call for twenty-five pounds of cabbage! I hate wasting food and was concerned that if it “went bad” or we didn’t like it that there would be a lot of cabbage to throw out and it wouldn’t even be compostable because of the salt. Second, I recall my grandmother’s batch of sauerkraut having an odor my young nose didn’t care for. This week the weather is going to be open-window warm, but we can’t always count on that. A closed up house and a stinky food experiment brewing on the kitchen counter are not a good combination. The first hurdle I overcame fairly recently. Looking around at people on the Internet making sauerkraut revealed many were making smaller batches. Duh! I’ve known how to scale recipes pretty much forever but for some reason I had a mental block about this one. I blame the looming image of those ginormous crocks. The second apprehension I reasoned away. I know my food tastes have changed since I was young so I probably have developed some kind of odor tolerance, too. As long as it’s not as bad as the collard blanching episode, I figured we’d survive. 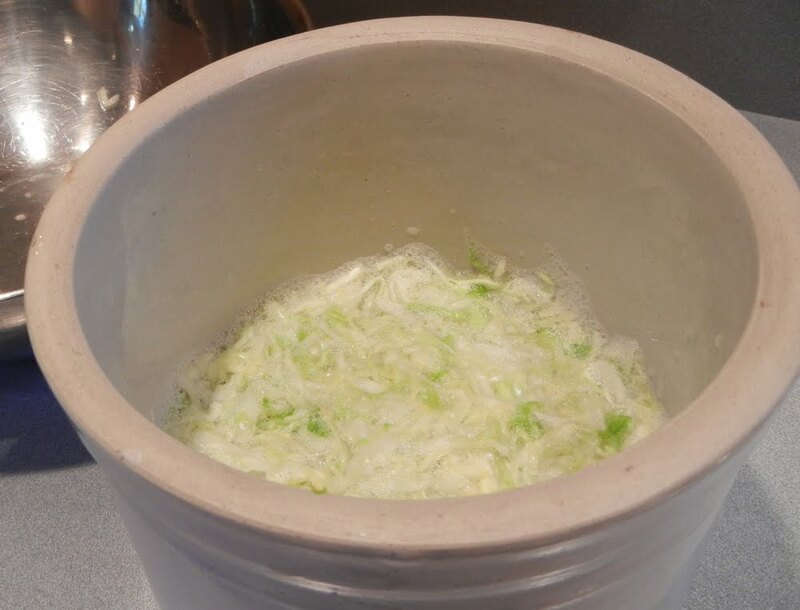 The ingredients in basic sauerkraut are simple and inexpensive: cabbage and salt. The cabbage, just shy of six pounds, I picked up at the Westside Community Market for a whopping $1.50. I’m sure it’s available for even less at other places. The salt I already had on hand of course and I would only need three tablespoons probably costing pennies. The crock was another matter. I’ve got a rectangular food-grade plastic container I use to make kombucha. The shape is no problem since a scoby will grow to fit, but for the sauerkraut I wanted something round so I could use the traditional method of weighting it down with a plate. As luck would have it we actually had a real stoneware crock sitting around that had not been drilled to function as a planter. I scrubbed it up thoroughly and put it to work. 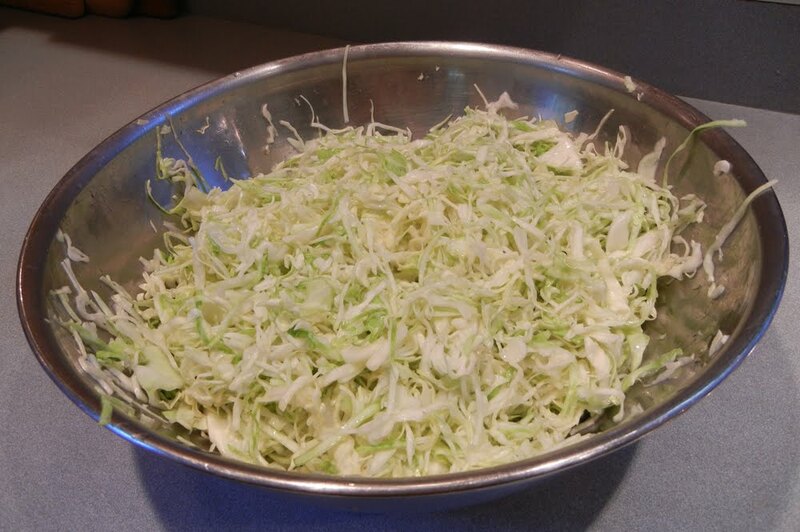 The first step was to cut the cabbage into as thin of strips as I could. I set to work with a knife and decided after less than two minutes there was no way I was going to do the whole head that way. Instead I resorted to the food processor and made much faster and perfectly acceptable progress. I began to get worried when the cabbage filled our two largest stainless steel bowls. There was no way it was all going to fit into that little crock! I decided to just proceed with the recipe and then either try to scrounge another container once the crock was full or grudgingly pitch whatever didn’t fit. I began salting the cabbage and mixing it around in the bowls with my hands. One of those little kitchen miracles started to occur. The strands of cabbage wilted and collapsed and the mounds got smaller and smaller. Soon I was able to get it all in one bowl and it still continued to collapse as I moved it around. 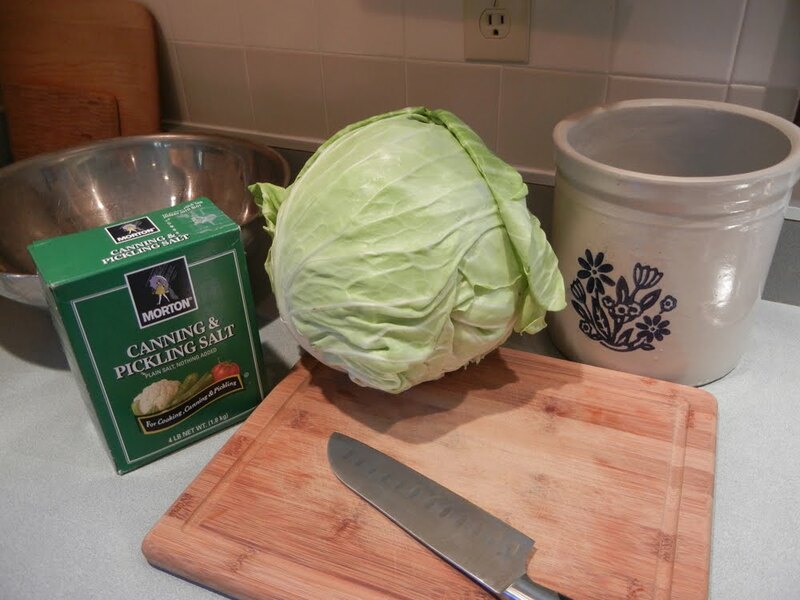 When I started packing the cabbage in the crock, tamping it down with my knuckles as firmly as I could without breaking it it took up even less space.While a whole head of cabbage may feel dense and heavy, it’s clearly got a lot of air in it. By the time it was all in, the crock which is less than eight inches across and maybe ten inches deep wasn’t even half full! By this point in the process a bit of juice but not a whole lot was starting to come out. There was just enough to cover the cabbage so I didn’t add any additional brine and put in one of Grandma’s plates in weighted down with a clean jar full of water. Soon after I got thinking about the gold band on the rim of the plate and substituted another kind of plate. I think the paint/glaze probably contains some kind of metal and I didn’t want to risk either the brine damaging it or the metal reacting with the brine and creating off flavors or even making the sauerkraut toxic. The final step was topping it with some plastic secured by a rubber band as suggested here. Now all I do is wait four or five weeks and keep the surface of the brine . As of this moment it’s been fermenting four days and yesterday began to show a small amount of foam bubbling up around the plate. I skimmed a bit of it off but am trying to keep the top on as much as possible to maintain at least a low oxygen if not actually anaerobic environment. Stay tuned for updates as this little project progresses.